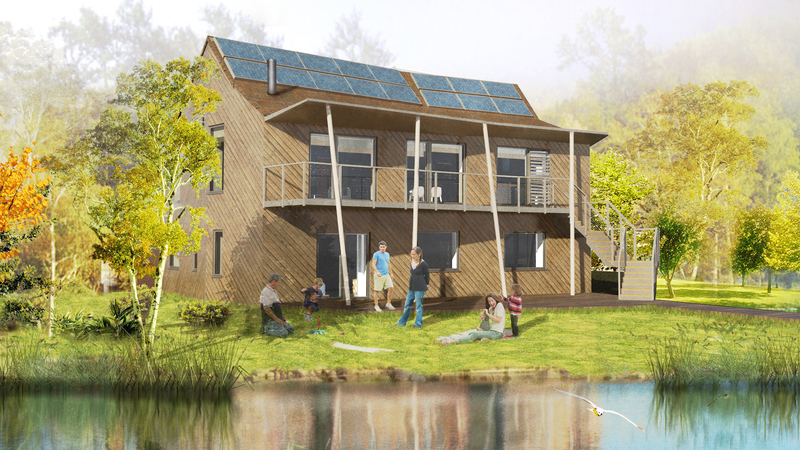 Warm in winter and cool in summer, the hemp-hAus, will combine spacious, contemporary living with the comfort and performance of Passivhaus and the low whole life carbon afforded by the use of natural, sustainable building materials. It will be a sustainable exemplar, achieving the Zero Carbon standard proposed for 2016. Built off-site, the system will offer all the benefits of speed of build on site and construction quality which will lend itself to the rigorous performance demanded by Passivhaus. The home is entered from the northern side, the access road and parking space, into a double height volume with an open staircase leading to the upper floor. The plan can be configured with the living spaces on the ground and the suite of bedrooms on the first floor or, as illustrated in our submission, with the main living spaces on the first floor. In this instance, the stair rises to the first floor, a dramatic entrance into the lofty living space with open views towards the South and across the lake. The living space recognises the importance of cooking and dining as a leisure activity. So the kitchen area is also planned to the front of the house with the same great views, supported by an adjacent utility room and pantry, to ensure that the kitchen is simple, stylish, effective and uncluttered. The living space also has an associated work space which can also be used as a further bedroom with supporting shower room. On the other floor are four bedrooms and supporting bathrooms but this could also be configured to give three bedrooms, one of which is a master suite with associated dressing room. The off-site construction system is based on an Offsite System using a timber frame with hemcrete and hemp fibre insulation to give high insulation with good thermal mass and ‘negative’ embodied carbon. Structural materials and finishes are generally of timber to provide a highly sustainable home with an extremely low embodied carbon content, all the materials sustainably sourced for minimum environmental impact. The construction of the home features an open web flooring system which will accommodates the distribution of building services, including the ventilation system, but also facilitates any future changes such as upgraded cabling systems.